Dave Challinor believes the referee who sent off AFC Fylde defender Neill Byrne on Tuesday shouldn’t officiate this weekend. The Coasters’ coaching staff were left bewildered when the centre-back was shown a second yellow card by referee Tom Reeves a minute from time in Tuesday’s 1-1 home draw against Dagenham and Redbridge. Byrne, who will be suspended for Saturday’s crucial clash against Eastleigh at Mill Farm, was accused of swinging an elbow at his opponent. But Challinor says there was “nothing” in the incident and, if anything, Fylde should have been awarded a free-kick. “I don’t need to speak to Neill about it – I’ve seen it,” he said. “I was shocked we didn’t get a free-kick, but then to see the referee produce a second yellow card I was more surprised. “Having watched the video back, there’s absolutely nothing there. The ref is 25 yards away. But if he thinks an elbow has been thrown, show a straight red card because we can appeal that and he would have been proved wrong. “But he doesn’t – he produces a second yellow, so we can do nothing about it and we’ll lose our captain for a game on Saturday against a team in the play-offs. What will the consequence be? “I will speak to the people who watch him (the ref) and score him, and will see what they come up with. 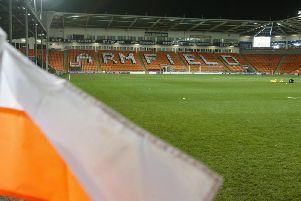 It was another frustrating result for Fylde, who are without a win in their last three outings. Danny Rowe’s free-kick, his 26th league goal of the season, levelled matters after Angelo Balanta had given the visitors an early lead. The Coasters searched for a winner to bolster their promotion hopes but couldn’t find a way past Dagenham’s stubborn defence. Challinor added: “I’m disappointed with our performance. We knew how they’d set up. If they’re going to play with a back five and three sat in front, then you have to get overloads out wide but we didn’t do. People kept trying to find a way through inside. “We get ourselves a lifeline from the free-kick but we just didn’t have the quality or the composure at the top end of the pitch to break them down. “I don’t think we created as many chances as Saturday. We’ve had some half-chances but there aren’t many that are glaring and you’re thinking, ‘We have to score’. When asked if he’ll be making changes for Eastleigh, Challinor added: “What you can’t get into a habit of doing is making kneejerk changes. “You can get carried away and think things are going to be easy but that’s never going to be the case. Teams are always going to make themselves difficult to beat.